India’s only impact investing industry body *Impact Investors Council (IIC)* kicked off its second edition of impact investing conference *Prabhav 2018* (7^th – 10^th October) in New Delhi. Prabhav was attended by more than 300 delegates from India and other countries including over 50 global impact investors. 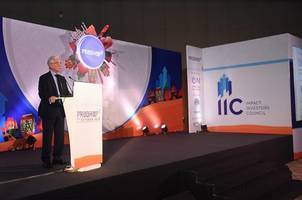 The inaugural session was chaired by *Sir Ronald Cohen*, Chairman, Global Social Impact investment Steering Group (GSG), where he spoke of impact investment’s crucial role in inclusive growth in India and how it will help achieve the United Nations Sustainable Development Goals (SDGs). The session was further addressed by key speakers Ms. Geeta Goel, Country Director, Dell Foundation and Chairperson Impact Investors Council, Ms. Roopa Kudva, Partner, and MD, India, Omidyar Network; Mr. Vivek Pandit, Director, McKinsey & Co.; and Dr. Rajiv Lall, Founder Managing Director & Chief Executive Officer, IDFC Bank. During Prabhav, there were nine parallel sector tracks meetings which focused on the issues of housing, agriculture, education, financial inclusion, energy, affordable health, skilling, sustainable cities, women empowerment and impact measurement. The key topics which was discussed during these meetings were *No Poverty through Financial Inclusion*, led by Royston Braganza - CEO, Grameen Capital; *Zero Hunger and Food Security *led by Hemendra Mathr - Venture Partner, Bharat Innovation Fund; *Good Health and Wellbeing* led by Mr. Krishnan Neelkanthan,​ Senior Director, Ankur Capital;*Gender Equality & Women’s Economic Empowerment* led by Kartik Desai, Executive Director, Asha Impact; *Quality Education: Decent work and Economic growth *led by Namita Dalmia, Principal - Investments, Omidyar Network; *Clean water and Sanitation *led by Mark Peters, Water, Sanitation & Hygiene Team Lead, USAID; *Affordable and Clean Energy* led by Avishek Gupta – Investment Director, Caspian; *Sustainable Cities and Communities *led by Mr. Ajit Pai, Consultant, Vice Chairman, Niti Aayog and *Impact Measurement *led by Dr. Emily G Wright - Fellow - Global Economy and Development, Center for Universal Education. During Prabhav 2018, IIC also organized grassroots immersion tours to social enterprises across New Delhi and Bangalore, where successful impact investing has helped improve the lives of underserved beneficiaries. The international delegates from Brazil, Australia, Germany, Japan, UK and the US had a fabulous time interacting with the real heroes of India, the Social Entrepreneurs. In Bangalore the delegates met Address Health, Milaap, Saahas Zero Waste and Cropin. In Delhi they visited Kamatan, Blowhorn, Avanti and Leapskills Field. The Prabhav'18 delegates represented the following organizations: Edvance Group, Deloitte, Fundacao Tide Setubai, ICE, QBE group investments, Fondazione Rava, TRIODOS, Ernest & Young, Elevar Equity and Lemelson Foundation. Impact Investors Council (IIC) is the industry association of Impact Investors in India. Impact Investors are financial investors who invest in social enterprises to deliver social (and environmental) impact to the poor in sectors such as Agriculture, Financial Inclusion, Affordable Education & Healthcare, Water & Sanitation, Clean Energy, Livelihoods, etc. Impact Investors use the power of both financial markets and social entrepreneurship to deliver such impact. IIC seeks to develop the impact-investing sector in India by focusing on impact measurement & standardization, research & policy support and self-regulation. IIC is a Section 8 company and can be found at http://iiic.in/.